In 1812, early "Red Hogs" were bred in New York and New Jersey. They were large in size. Large litters and the ability to grow quickly were characteristics Durocs possessed from the beginning. The foundation that formed today's "Duroc" was comprised of Red Durocs from New York and Jersey Reds from New Jersey. In 1823, Isaac Frink of Milton in Saratoga County, New York, obtained from Harry Kelsey of Florida New York, a red boar, one of a litter of ten pigs. The sire and dam of these pigs were probably imported from England. Kelsey owned a famous trotting stallion named Duroc, so Frink named his red boar in honour of the horse. This boar was known for his smoothness and carcase quality. His progeny continued the Duroc name and many of them inherited his colour, quick growth and maturity, deep body, broad ham and shoulder, and quiet disposition. The Duroc was smaller than the Jersey Red, with finer bones and better carcase quality. Beginning in the early 1860s, Durocs were made from a systematic blending of the two very different strains. The first organization for the purpose of recording, improving, and promoting Red Hogs was the American Duroc-Jersey Association, which was established in 1883. At the 1893 Chicago World's Fair, Durocs gained wide popularity at the first successful Duroc Hog Show. The Duroc made two attempts to gain a foothold in this country; the first in the early 70s was not very successful, although some of those pigs were exported on to Denmark. They were re-imported in the early 80s and a comprehensive trial was undertaken by the MLC to assess the merits of the Duroc as a terminal sire. It was found that in the British skin-on fresh pork market the Duroc could not be used as a purebred but only as component of a crossbred boar. The development of Duroc crossbred boars produced large numbers of crossbred gilts. A market was found for these due to a resurgence of interest in outdoor pig production. This has resulted in breeding and selection programmes for the British Duroc focusing on female line characteristics rather than the traditional terminal sire traits associated with the breed. The Duroc has now found a special niche in the British industry and a unique British version of the breed has been developed. Their thick auburn winter coat and hard skin allows them to survive the cold and wet of the British winter. This coat moults out in summer to leave the pig looking almost bald, but as a consequence it can cope with hot dry summers equally well. 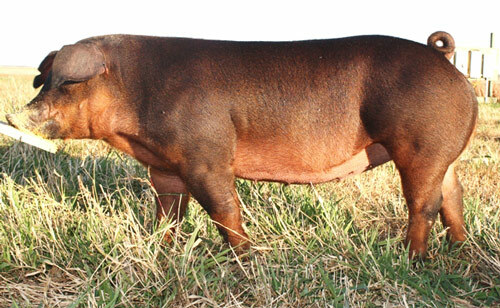 All purebred Durocs are red in colour and the development of a so-called “White Duroc” has only been achieved by crossbreeding with a white breed. Its tenacity in looking after its young combined with its docility between times makes it an ideal candidate for an outdoor pig, either as a dam or sire line, and its succulence and heavy muscling makes it very suitable for anything from light pork to heavy hog production. Further research funded by the MLC has investigated the Duroc’s claim to produce high levels of tenderness. This has led to a recommendation to include Duroc genetics as part of the meat quality Blueprint.